Adam Smith is one of the most important historical figures for liberal thought and economic freedom. He is best known for ‘Wealth of Nations’, which challenged the role of the government in economics and helped establish the basic foundation of modern capitalism. Smith was born in Kirkcaldy, Scotland in June of 1723. The exact date of his birth is unknown but many historians treat the day of his baptism, June 5th, as his official birthdate. His father, also named Adam Smith, died two months after he was born, leaving his mother, Margaret Douglas a widow. Adam Smith pursued schooling from an early age, and attended the Burgh School of Kirkcaldy from 1729 to 1737. Smith attended the University of Glasgow at the age of 14 and in 1740 he attended the University of Oxford. After leaving Oxford, he began delivering public lectures in 1748 in Edinburgh, Scotland. As well, around the same time he began to develop a friendship with David Hume, the famous Scottish philosopher. The two wrote to each other about a variety of topics, such as: history, economics, politics, etc. Throughout the 1750s and early 1760s Smith was a professor of logic at the University of Glasgow where he began to develop many of his ideas of the world. In 1763, Smith was offered a tutoring position by British politician Charles Townshend for his stepson Henry Scott. Smith accepted the position and spent the next several years travelling Europe with Henry Scott as part of his education. On these journeys, Smith came into contact with several key thinkers and philosophers from the Age of Enlightenment. For example, in Geneva, Smith met with Voltaire, and in Paris, he met with the famous Physiocrats thinkers and philosophers. The physiocrats opposed mercantilism, the economic theory of the time, and instead supported free markets without government control. Smith would famously write about Laissez faire economics, which he developed from the ideas of the physiocrats. In 1766, Smith returned to Kirkcaldy, Scotland, where he began writing his most famous work. 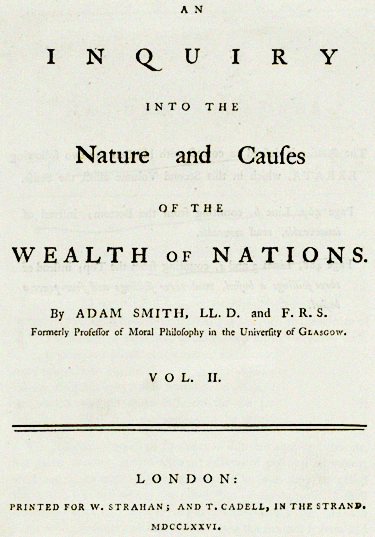 Its full title was ‘An Inquiry into the Nature and Causes of the Wealth of Nations’ which is just often shortened to ‘Wealth of Nations’. The book was published in 1776 and became one of the most influential economic writings of all time. It challenged the idea that the government should control the economy and instead proposed the idea of free trade and competition with a lesser role of the government. The ideas of this book would eventually lay the foundation for the principles of capitalism, which is an economic system that supports the idea of free trade and choice as a way of achieving prosperity. 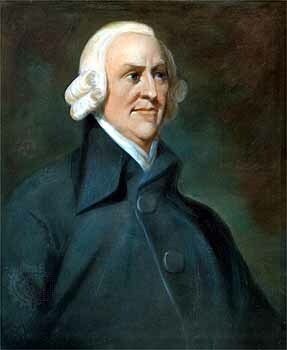 Like the physiocrats, Smith argued against mercantilism and government control of the economy and instead proposed the idea of the ‘invisible hand’. Simply put, the invisible hand is the idea that the market forces of supply and demand should drive the economy of a country. 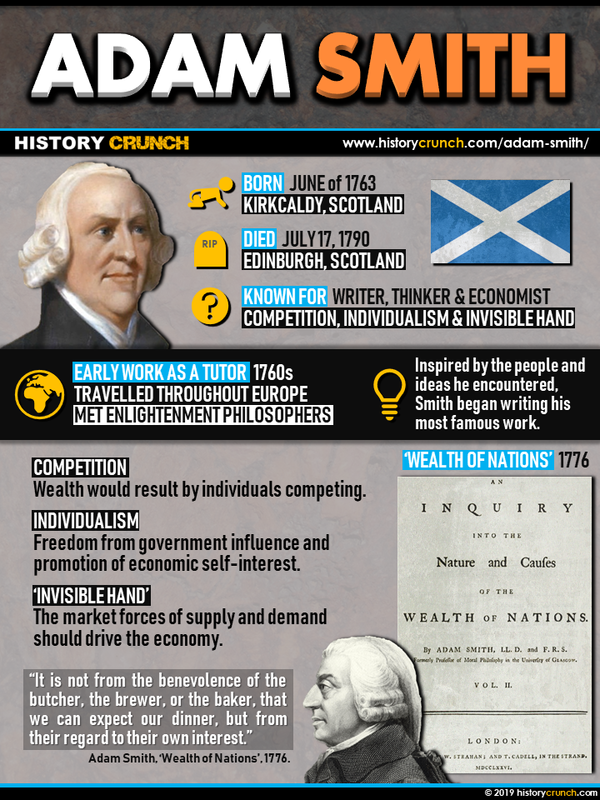 Adam Smith died on July 17th, 1790 in Edinburgh, Scotland. Today he is remembered for his immense contribution to economic theory and the development of free market capitalism, which has developed across much of the world. Many historians view him as one of the great liberal thinkers of the Enlightenment and helped the development of classical liberal thought.